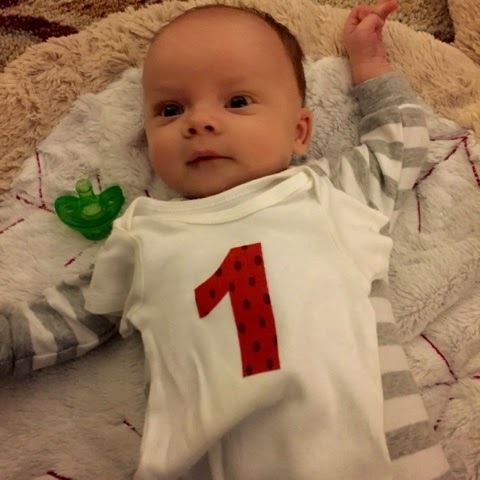 I've got a little over an hour to post a one month update so now's as good of time as any to grab the one month onesie and take a photo. This little guy loves to eat (as evidenced by the onesie that's laying on him because it doesn't fit) and hates dirty diapers so we're feeding and changing all the time. Quite the opposite of his sister who could skip meals if we let her and doesn't like her diaper changed. GMac is also a fan of being held (yay for the baby carrier!) and loves his mobile in his swing and pack-and-play. He also loves his big sister who loves him back twice as much.